The Toronto Waterfront renewal is the largest urban re-development project currently underway in North America. It is transforming Toronto’s waterfront into parks, public spaces, cultural facilities, commercial development and residential units. This development is increasing the economic value of Toronto, making it a more desirable city to travel to for tourists, and a better place to live for Torontonians. The goal is for Toronto’s Waterfront’s projects to be socially responsible and environmentally friendly. So far, Waterfront Toronto has done exceptionally well in meeting this goal, achieving LEED (Leadership in Energy and Environmental Design) Gold status for the renewal’s environmental sustainability. The projects will take a long time to complete (an estimated 25-30 years) but at the end, Toronto will have a magnificent waterfront that will both stimulate Toronto’s economy and provide vibrant places for the public to enjoy. 1700s: In 1750 the French began building Fort Rouille, a trading post on the Lake Ontario Shoreline. After the American Revolution, the British thought that this trading post would be an ideal place for a naval base and began construction of Fort York in 1793. 1800s: Factories were built along the shoreline to help facilitate trade. In 1850, due to lack of available land, a massive campaign of lake filling was undertaken to increase the amount of shore land. This lake-filling continued for one-hundred years. Early 1900s: With industry concentrated at the waterfront, the wealthy moved from the urban downtown Toronto to the cleaner suburbs. In the 1970s a global revolution began as cities began to rediscover and reclaim their waterfronts. In 1999 the Canadian government announced the formation of a task force to make recommendations for developing the waterfront as part of Toronto’s bid to host the 2008 Summer Olympics. 2000s: After the Olympics were awarded to Beijing the government decided to continue with the plan to revitalize the Toronto waterfront, establishing Waterfront Toronto. In 2002, the government of Ontario passed the Toronto Waterfront Revitalization Corporation Act, making Waterfront Toronto a permanent organization. The cost of revitalization is currently estimated to be $34 billion. Most trees built in Toronto die prematurely after seven to ten years because soil under pavement is overly compacted and prevents the roots from growing. New tree planting technology features a web of boxes named silva cells that are placed underneath the pavement. These boxes support the pavement and prevent it from compacting the soil. When trees are planted in silva cells they are much healthier because the less compacted soil is rich in nutrients. The system allows tree roots to spread and thrive resulting in mature trees with larger foliage. Waterfront Toronto has installed silva cells in several new parks and public spaces including Canada’s iconic Sugar Beach. As construction continues across the waterfront, silva cells will be critical to the success of the urban forest. 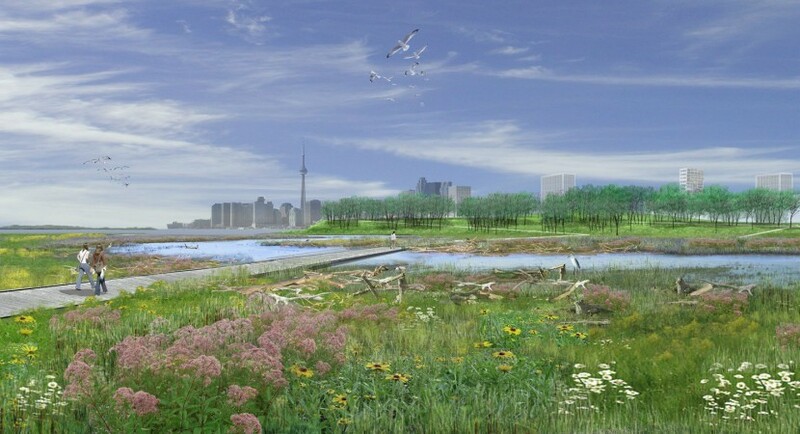 How the Toronto Waterfront Renewal impacts you? Sean is an intern at the Canadian Urban Institute and is currently studying Philosophy at Queen’s University. In his free time he enjoys reading poetry, writing music and going for walks with his dog Harley.